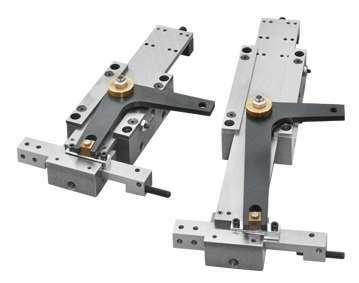 The AGR Rectangular Tucker is a standardized and refined version of a basic principle which converts straight line motion into rectangular motion. When special tooling is attached to the cross slider, the mechanism engages a part or component and moves into position in the workstation and returns for another part. The rectangular Tucker is made in three standard sizes: the RT-2 (2″ maximum stroke), the RT-4, (4″ maximum stroke) and the RT-6 (6″ maximum stroke). The maximum stroke of the cross slider on all units is 1″. They can be operated mechanically from the basic machine cam shaft, or air cylinder. Tuckers are most commonly used for the transfer of parts from a rail or magazine into a workstation. They are sometimes used for separation or final orientation of parts in conjunction with the UniPlace® mechanism. The Tucker is equipped with adjustable screw stops to provide accurate positioning of tools and to limit both longitudinal and cross-motions. The self-powered unit is mounted on a plate so it can be set at any desired angle. Each unit provides a full range of stroke adjustment and is designed for universal mounting on UniClamp® fittings. Our engineers are prepared to design special heads or other accessory tooling to take full of advantage of the flexibility of motion and work capabilities of these units. Used singly, in coordinated grouping, or in combination with other mechanisms, the AGR Rectangular Tucker is an extremely versatile unit.